[S483] 1850 U. S. Census population schedule, Ohio, Fairfield County, Violet Township, page ?, line 37, dwelling 61, family 61, Henry Langle household. [S240] 1880 U. S. Census population schedule, Ohio, Fairfield County, Violet Township, ED 202, page 31, line 5, dwelling 271, family 285. 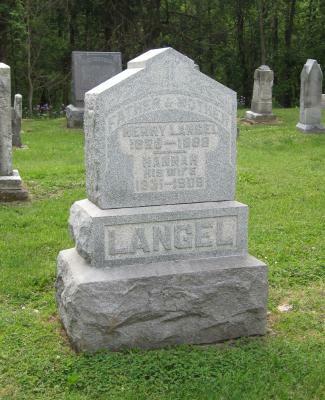 [S2334] Henry Langel and Hannah Langel Cemetery Marker, Mt. Zion Cemetery, Liberty Township, Fairfield Co, OH. [S312] International Genealogical Index (IGI), film 1760831. [S2443] Fairfield County, Ohio Deed Books 1801-1899, Book 22: 395-6. [S241] 1870 U. S. Census population schedule, Ohio, Fairfield County, Liberty Township, page 43, line 19, dwelling 297, family 306, Ohio, Fairfield County. [S1462] Probate Case Files 2575 and 5239, Henry Langle's Application for Letters of Administration for Elizabeth Langle's Estate. [S1462] Probate Case Files 2575 and 5239, Elizabeth Langle Estate Sale Bill. [S1484] Fairfield County, Ohio, Probate Case Files 6975 and 7072, Will and Testimony of Witnesses. [S241] 1870 U. S. Census population schedule, unknown cd2, Ohio, Fairfield County. [S314] International Genealogical Index (IGI). [S321] International Genealogical Index (IGI). [S2315] John Wesley Langel, Ohio, Deaths, 1908-1953, John Wesley Langel. [S319] International Genealogical Index (IGI). [S318] International Genealogical Index (IGI), film 1760769. [S317] International Genealogical Index (IGI). [S316] International Genealogical Index (IGI), film 1760760. [S315] International Genealogical Index (IGI), film 1760760.